At the beginning of this semester, some English Composition students found that not all OCCC classrooms are created equal. 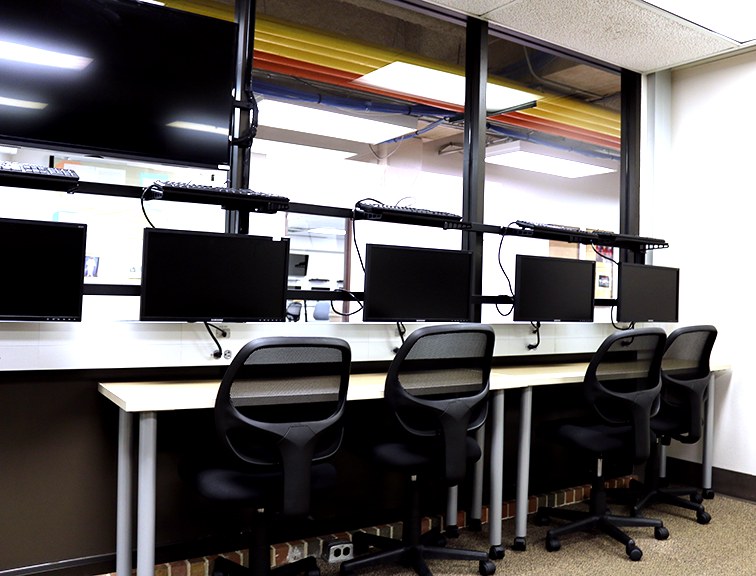 Three classrooms in the Arts and Humanities area were converted into interactive classrooms over the summer. The board’s functions are like a big tablet. English Professor Mark Zindelo said these boards have brought about positive changes, including improving how students behave in class. 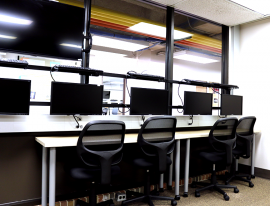 He said, with the computers mounted on the perimeter of the classroom, with every screen visible, students are less likely to use class time and the computers to do non-class-related activities. He said it helps him be in more control. With the genius boards, students also can learn lessons in new and fun ways, such as playing the Grammar Ninja game, Zindelo said. He said students are happy with the changes as well. “I know when the students came in the class this semester, [and] saw all the technology, their eyes were really wide and they were really surprised,” Zindelo said. He said because of the changes, he feels students and professors now interact and engage in discussion more. English Professor Linda Robinett agrees. She said while she likes the interactive board, she really is excited about the monitors mounted around the room. “ … Four students can work in a group and they can be working on documents which are on the monitor,” she said. She said she likes the new way of teaching better than how things were done in the past. “I like students to have computers because in the writing class, they can type the paper in front of me and I can watch it,” she said. English Professor Makenna Green also teaches in one of the updated classrooms. Green said she believes technology in the classroom can help make students feel more comfortable about learning because it’s similar to what they are doing outside classes. “ …Technology is constantly changing and we have students who are using Moodle on their smartphone, or on tablet or on iPad,” she said. Green said often, her students end up teaching her things about the classroom technology. “ … They are really good at using genius boards and they are also really good at using the side monitors that match the genius boards,” she said. Green said the interactive board saves her a lot of time in class. However, a couple of the professors said there are still some slight issues in the classrooms. Zindelo said they are too bright which causes students to have problems in viewing the board. Also, the classroom was designed with movable tables so the room can be customized to each professor’s needs. Robinett said that can be bothersome at times. “We do have to move the furniture a lot,” she said. “ … If we want to use the computers [we] have to move the tables [around the edge]. Not all professors have elected to use the updated classrooms. Zindelo said some professors still prefer to teach in a more traditional way. “It is about comfort,” he said. “It is their way and they feel the best that way. They feel the most confident that way. Green said some professors don’t like feeling much anxiety in class, so they do not want to change their way in teaching. “Sometimes, you have to be prepared for situations like the power goes down, genius boards blacks out,” she said. “Sometimes, professors don’t like feeling that anxiety — when something goes wrong and not knowing what to do. Jamarst Scott, business management major, said the genius board is great. He said he has been in a class where a Smart board was used but this is his first time to be taught using a genius board. He said the genius board is sturdier. Psychology major Cristo Silva said he likes the genius board — especially for his English composition class. He said he likes everything in the new classroom, except the movable tables.